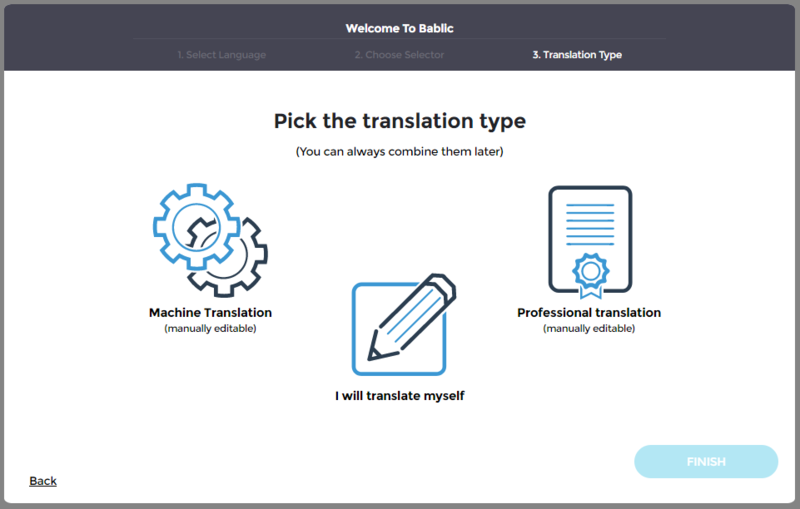 Bablic allows you complete flexibility when it comes to translating your content. You can choose between Machine Translation, Professional Human Translation, or your own manual translation. Of course, any combination of the 3 is possible. You can choose the type of translation you want, but keep in mind that you can always change it later! If you want top notch content of the highest quality, we recommend using Professional Human Translation. You'll be able to choose the translation provider from a list of trusted partners. If you are able to translate on your own you can start from scratch or you can use machine translation as a base and then edit the content manually to improve its quality. You can do so yourself or you can invite collaborators to edit the translation on your behalf. The type of translation you choose does not need to apply to the entire website. You can select specific pages for professional translation, and keep the rest for yourself. You can apply automatic machine translation if you want to translate content quickly, and manually edit whenever you have more time. Long story short, Bablic allows you to manage your content easily and effectively according to your specific needs.